Today has seen the start of VMware's annual conference VMworld (US), this year taking place in Las Vegas. We saw VMware's CEO Pat Gelsinger take the stage, despite having broken his foot, to update us on the industry and VMware's vision for the future. The message this year was one very much about connecting any cloud, simplifying management, automation, deployment, cost and more. 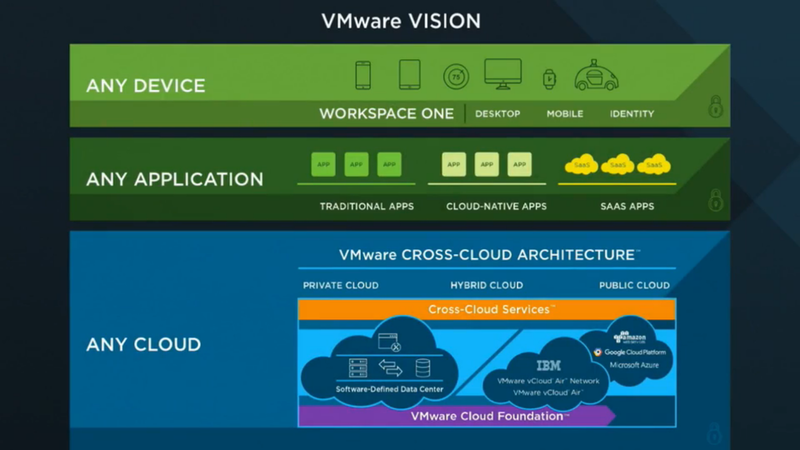 We saw VMware announce 'VMware Cloud Foundation' available in your infrastructure or in the cloud through IBM, delivering vSphere, VSAN, NSX and SDDC Manager. We also saw a preview of VMware Cross-Cloud Services, a SaaS application allowing you to connect AWS, Azure and Google Cloud Platform. Below you will find my doodle from the keynote listing some of the highlights. To watch the recording of the VMworld keynote, click here. See below some of the images from the keynote presentation.